Welcome to the world of the Future, today! After over a decade of difficult times (the Great Depression, and then WWII) the US was booming economically. The average family had a disposable income, there was the rise of a new demographic - teenagers, and consumerism went wild. The population was encouraged to spend like there was no tomorrow, and given the Cold War obsession with the likelihood of an A-Bomb strike by the USSR at any time, it's not surprising that the idea took off. Everything should be NEW! Your life will really be IMPROVED! 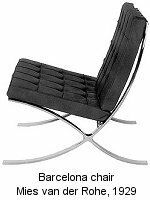 by that stylish new chair. Don't let the Prelinger category title of Futurism fool you, there's no ranting F.T. Marinetti, just a bunch of shiningly optimistic American 50's footage. Art Deco retained an influence in the US after WWII, in particular Streamline Style. 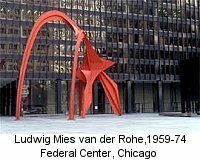 The International Style was becoming increasingly important, in particular in urban architecture. Domestic architecture was to some extent influenced by both Art Deco and the International Style, but there were also other, nationalistic forces at work, particularly after the war. Frank Lloyd Wright was particularly well known for his opposition to the International Style which he considered to be communist. Politically, this was a tumultuous time in the US with the McCarthy communist witch-hunts causing deep divisions. The Cold War was at it's peak (the fabulous "Duck and Cover" how-to-survive-an- A-bomb-attack video on Prelinger is from this same era). Ah, but if you're a Consumer, you won't be like those horrid Communists, so Spend! Spend! Spend! 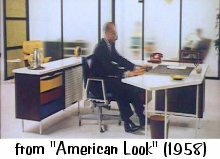 This mass consumerism was held to be just what any loyal American MUST aspire to: "By the way things look as well as the way they perform, our homes acquire new grace, new glamour, new accommodations. Expressing not only the American love of beauty, but also the basic freedom of the American people, which is the freedom of Individual choice". There was also a feeling that Man had dominated nature: "Engineering the shape and look of machines that change the shape and look of the land itself". 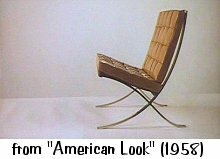 The somewhat kitsch Lounge styles developed in the 1950's. 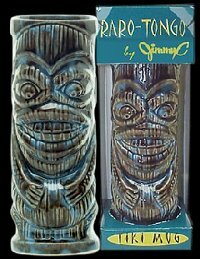 For example, the primitivist Tiki Style which is currently having a bit of a revival as a retro style. 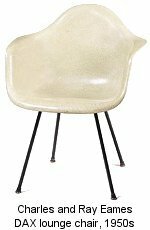 Another Lounge-style that was popular was the Atomic or Space Age Style. 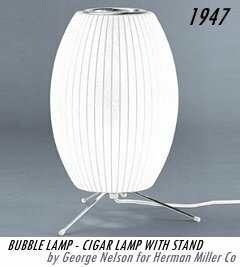 Think, the Jetsons, Lost in Space, B-Grade movies about zombies from outer-space, Sputnik-lamps. www.rotodesign.com/fonts - Some very nice, free retro fonts for PC and Mac. 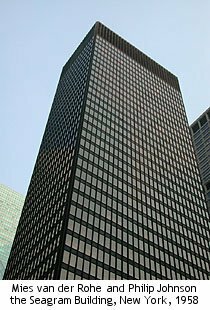 The Seagram Building, built in 1958, is one of van der Rohe's significant buildings. Completely clad in bronze and set back from the street to only use a portion of the expensive real estate, the Seagram is considered to be one of the most opulent examples of the International Style. In 1932, philanthropist George Gough Booth and Finnish architect Eliel Saarinen founded a school of Art and Design near Detroit, Michigan. 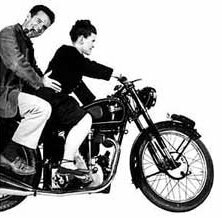 Famous students include Harry Bertoia, Charles and Ray Eames, Eero Saarinen, and Florence Knoll. 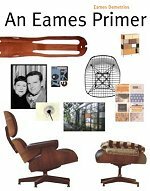 Although Finnish by birth and French by education, Eero Saarinen's work was mostly done in the United States so I've included him here. 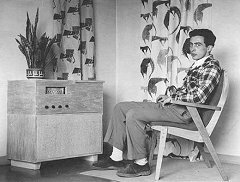 Eero collaborated with his father, Finnish architect Eliel Saarinen, until his father's death in 1950. 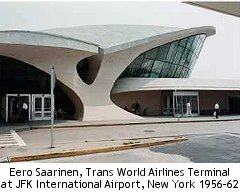 Eero Saarinen's biomorphic masterpiece, the Trans World Airlines Terminal at JFK Airport was completed only after his tragic early death from a brain tumor in 1961. Born in Italy, Harry Bertoi moved to Canada and then the US in the 1930's and taught metalwork at the Cranbrook Academy. 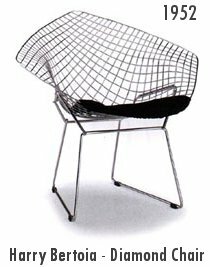 Although he was an artist and sculptor, he is best known for his wire furniture, such as the Diamond Chair. 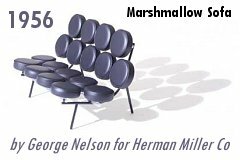 His famous Marshmallow Sofa was made from 18 standard barstool seats for the Herman Miller Co in 1956, and is again in production. Options in different colours, combinations of colours and also larger sizes (up to 10 stools across) have been manufactured.